On Tuesday, Susan and I attended a screening of “Algrren,” a compelling new documentary film about the late Chicago writer Nelson Algren, best known for chronicling stories about the seedy, down-and-out side of the city in the decades before and after World War II. For much of his adult life as a writer of fiction, Algren lived in and around the Wicker Park neighborhood, not far from West Town, the neighborhood where I was born and raised. Given the dramatic cultural and economic changes that have taken place, one has to wonder whether Algren would appreciate or even recognize his Chicago today. As depicted in black and white footage, still images and commentary from people who knew the writer and others, the film reveals that Algren frequented dive bars, gambling dens, brothels, police stations, boxing rings and other places far outside polite society. It was an ugly, dirty and depressing corner of the city; yet Algren often found beauty, truth and passion in Chicago’s downtrodden and the shadowy places they inhabited. The film does not reveal much new about Algren, his life and loves (he had a four-year affair with French feminist writer Simone de Beauvior) and his writings. 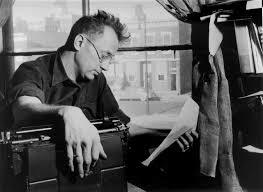 But there’s plenty of interest for true scholars as well as more casual fans of Algren, like myself. Yes, the street grid is pretty much the same, and most of the same store fronts and two-flats are still standing. There might even be an operating tavern or two Algren frequented back in the day. What’s gone from much of Chicago is the character — and characters — that drew the writer to live with and portray life from the perspective of those people hanging from the fringes. Algren’s Chicago was black and white, but man was it colorful in its own way. There’s nothing wrong with change, and in today’s world change happens a lot faster and with more profound impact than in generations ago. Perhaps that’s why, as noted in “Algren,” in 1975 the writer boarded a train East and eventually settled in a small rented home in Sag Harbor on Long Island in 1980. His Chicago was a place he could never find again. This entry was posted in Uncategorized and tagged Algren the Movie, Chicago, Chicago neighborhoods, hip Chicago neighborhoods, Nelson Algren. Bookmark the permalink. ← More Blurred Lines of Communication?